We’re pleased to learn the former Westwood Yarns site in Holmfirth is to be transformed after acquisition by property developer Prospect Estates. Met Consultancy Group was employed by Prospect Estates to carry out a full topographical survey of this 8.54 acre historic mill site, including elevation surveys of the listed buildings to aid the planning and design of the proposed re-development. In addition to providing community work space, Prospect Estates plans to construct 50 residential units, convert the historic mill into 12 apartments, and transform the Millpond Building into a hotel and restaurant, whilst preserving as much of the original character of the mill as possible. 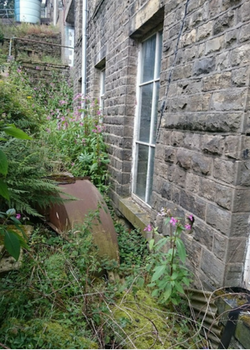 When Met Consultancy Group surveyed the site, although it was only a short time since production at the Mill ceased, nature was quickly reclaiming the area which, alongside a difficult terrain in the steep side valley, presented a challenging site to survey. It is great to see the mixed use scheme starting to take shape and we wish Prospect Estates well with this venture. It is hoped that works will begin in early 2017, with the redevelopment bringing welcome jobs and investment to Holmfirth. Find out more about our survey services including: topographical surveys, measured building surveys, GPR, laser scanning and utility mapping.